Did you know that adults over the age of 35 lose more teeth to gum disease than from tooth decay? Your teeth are the only body part that does not have a natural self-cleansing process. That means you need to do all the work. Harmful and sticky bacteria called plaque will accumulate on your teeth and cause issues in your mouth if you do not take preventative measures to keep your teeth clean. Both periodontal disease and tooth decay are caused by plaque. Daily brushing and flossing, and routine trips to the dentist, will help fight against tooth decay and periodontal disease. The experts at Higson Dental Group are happy to help the people of Grande Prairie maintain healthy teeth and gums, and we always welcome new patients. Daily brushing is important to maintaining healthy teeth and gums, but doing it properly also matters. Your gums are made of delicate tissues, so we recommend using an ultra-soft or soft bristle toothbrush. To start, place your brush at a 45-degree angle from where the gums and teeth connect. In a circular motion, continuously move the brush around the outside of your teeth with small gentle strokes. Brush in, around and between your teeth with slight pressure, but not so hard that it feels uncomfortable. Once the outside surfaces of your teeth are done, follow the same directions for the inside of the back teeth. For your inside, upper and lower front teeth, hold your brush vertically, and move back-and-forth to clean. Next, use short strokes to clean the biting surfaces. Change position as needed. Make sure you are able to make contact with and clean all surfaces, including the gum lines. Just keep it gentle and purposeful. Watch yourself in a mirror to make sure you have reached every spot. Finally, rinse well to clean out any remaining plaque that may be loosened from brushing. If you experience pain or discomfort while brushing, or would like to learn advanced brushing techniques first hand from one of our dental hygienists, call our office for a consultation. Harmful bacteria that cause periodontal disease like to accumulate above and below the gum line. This is a tricky area to reach with a toothbrush, which is why we need to floss. Dental floss can help remove plaque from tighter spaces but it’s important to do it properly so you don’t harm your gums. Use an 18-inch long piece of waxed floss and lightly wrap most of one end of the floss around the middle finger on one hand, and most of the other end of the floss on the middle finger of your opposite hand. To reach in between the upper teeth, pull the floss so there is no slack between the thumb and forefinger of each hand. Lightly push the floss between the teeth and move the floss back and forth very gently. Guide the floss down to the gum line and make a C-shape motion against the tooth, insert between the tooth and gum and move up and down the side of the tooth. Keep going until both sides of all upper teeth have been flossed. Once the floss has lost tension and is dirty, release more from your finger and find a fresh section to start again. Next is the bottom teeth, following a similar regime, move the floss using your forefingers on both hands until all teeth have been flossed. Once again, use water to rinse out any lingering plaque or food particles. It is very common for your gums to feel tender or bleed when you start flossing. This will usually subside once your mouth is used to the regime and the plaque has been removed, allowing your gums to heal. However, if your gums continue to bleed and hurt while you are flossing, you could be moving the floss with too much force, so try to use a more gentle motion. Call Higson Dental if you have any questions or concerns on proper technique. If you have just undergone a dental procedure, your teeth may feel sensitive to hot and cold. This is a natural reaction to work done in a delicate area and should calm down within a couple of days so long as the mouth is kept clean. However, if the mouth is not cleansed daily, the sensitivity can worsen. If you have prolonged sensitivity on your teeth, come in and see us at Higson Dental Group. Our team will determine if you need a special medicated toothpaste or mouth rinse designed for sensitive teeth. If you feel overwhelmed with the number of oral hygiene products on the market, you’re not alone. Which ones are the best? We’ve put together some points to help you choose the best products for your mouth. Electric toothbrushes are safe and work well for most people. If you experience limited dexterity, these automatic toothbrushes will be more effective than trying to clean your teeth manually. Our team has seen excellent results with the SonicCare brand toothbrush. You can purchase these electronic toothbrushes at Higson Dental at a lower rate than regular retailers. Water spraying devices (also known as oral irrigators) are used to provide a powerful rinse for your mouth, but note that they do not rid you of plaque—you must brush and floss plaque off before it can be removed. If you plan to use an irrigator, make sure you brush and floss first. You may wonder why some toothbrushes have a rubber tip on the handle. This is to massage gums after brushing, which can help with removing any remaining plaque and excess food particles. Interproximal toothbrushes have tiny bristles that are designed to clean between your teeth. However, if either of these products is used incorrectly, you could damage your gums. Talk to the Higson Dental Group team about it. We can coach you on how to use these hygiene aids properly. Regular brushing and flossing in conjunction with a fluoride toothpaste and mouth rinse is the optimal combination. This regime can lower your risk of tooth decay by 40%. Tartar control toothpastes can also help to remove tartar above the gum line. But since gum disease occurs below the gum line, there is no proof that these pastes will reduce the risk of periodontal disease. Look for anti-plaque rinses approved by the Canadian Dental Association and made with special dental agents that help fight gum disease. As with all other dental products, these rinses are only effective when used in conjunction with regular brushing and flossing. 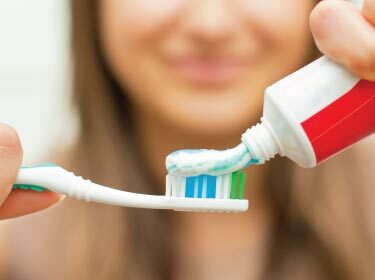 Your daily home routine is a crucial part in maintaining healthy teeth and gums. However, regular brushing and flossing does not always remove all the built up plaque and tartar. Our hygienists at Higson Dental group are trained experts and will give your teeth a professional cleaning every six months. This deep cleaning will help remove hard calculus from places your toothbrush and floss may easily miss. These professional treatments are essential in the prevention of tooth decay and periodontal disease. Keep your teeth for a lifetime! Call Higson Dental Group today to book a professional cleaning and learn proper brushing and flossing techniques. We are always welcoming new patients from Grande Prairie and its surrounding areas.